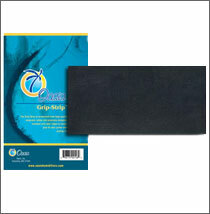 The Oasis® OH-22 Grip-Strip™ is formulated from high-quality, textured, neoprene rubber. Precisely designed with slip resistant anti-skid ridges, it creates a secure grip for your guitar whenever it’s resting on your leg. You don’t have to worry about your guitar slipping and sliding around while you’re playing anymore. Grip-Strip™ works with both steel string and classical guitars, and it won’t harm the French polish finish on classical guitars. Oasis® OH-22 Grip-Strip™ $9.95 each.